Here are the latest photos of the half-finished models in the Stuart workshop. At least when they are in the uncovered state, you can see some of the construction methods more clearly than when they are finished. I tend to have several planes on the go at any one time, which prevents boredom setting in, but does mean they tend to take a long time to finish! As time has gone on I've noticed how much smaller this page has become, indicative of the fact that I have made an effort to finish off some long-standing projects. I also took a hard look at my bones collection and threw out a few that I knew would never get finished! This is the Golden Age kit, which I can highly recommend, in the process of conversion to CO2 power. The motor is a Gasparin GM 120, and I am hoping to hide the filler nozzle inside a removable pilot. You can see the tank between the motor and nozzle. I have built in a lower access hatch under the motor so I can get at the mounting bolts, and will have a removable nose block behind the propellor. Scale is close to 1/16th. 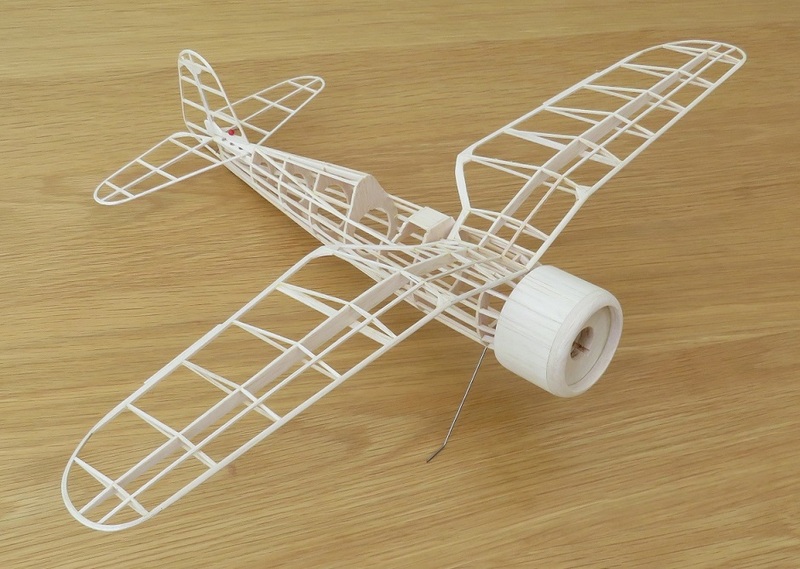 As usual, I could not resist putting in a couple of extra fuselage stringers. This should not be a problem, as I will have no weight of rubber in the rear fuselage to worry about. Not much to say about this one - it is the West Wings kit, started in a fit of enthusiasm when it first came out, and sitting around in this state now for many years. I am planning to power it with two rubber motors, one driving each propeller. The kit is very well designed, but there is plenty of scope for weight reduction. 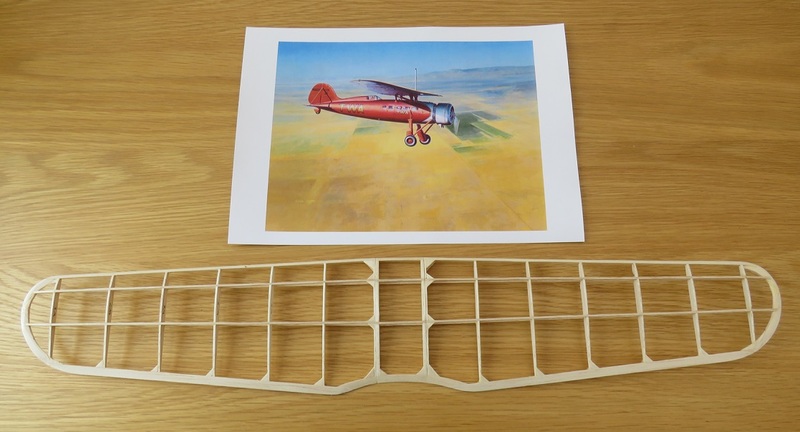 I won the this old West Wings kit in a raffle (it has the original peel-off paper patterns on the parts sheets) and for no obvious reason took it away on one of our trips up north to cut some bits out. Before I knew what had happened, I got to this stage. 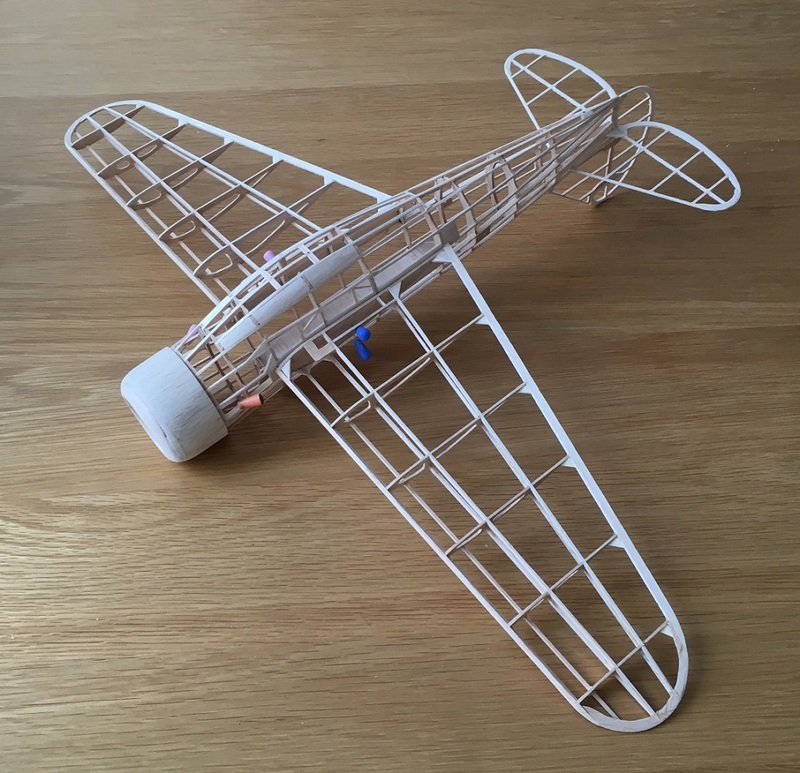 You might notice in the photo that as the design does not feature side keels for the fuselage, I have attempted to keep everything straight when adding the stringers by temporarily gluing scraps of balsa sheet between each former on both sides. These will come out anytime soon. I plan to finish the model as an Audax in desert colours, just to be different. My old peanut scale PZL P.24, built from Pres Bruning's plan was a good flyer, and it's a type I rather like, so I thought it would make an unusual aircraft for the FAC WW2 mass launch event. For a one-piece model the size was determined by it having to fit in my model box, so I drew it up at 1/24 scale, giving a wingspan of 18 inches. The wing is a cracked rib structure to keep it light and the bones you can see here weigh 9 grams so far. I'll be finishing the model as a Romanian machine that saw action early in WW2, defending Bucharest against Soviet bombing raids. I haven’t built a Diels kit for a few years so thought it was about time I did another one. My last one was the Curtiss Shrike back in 2011 – I still fly this regularly outdoors and am happy to chuck it about even in windy conditions as it’s very stable. Quite how I chose the North American O-47 out of my stash I’m not at all sure! I quite like its portly shape and the viewing windows under the wing look fun to model, but that’s not much of a reason really! I have a good collection of Diels kits, for many of which I bought reference books for documentation purposes and for which I have colourful schemes planned. Instead of these I chose to build an old kit I got cheap on Ebay because many of the parts had already been cut out. 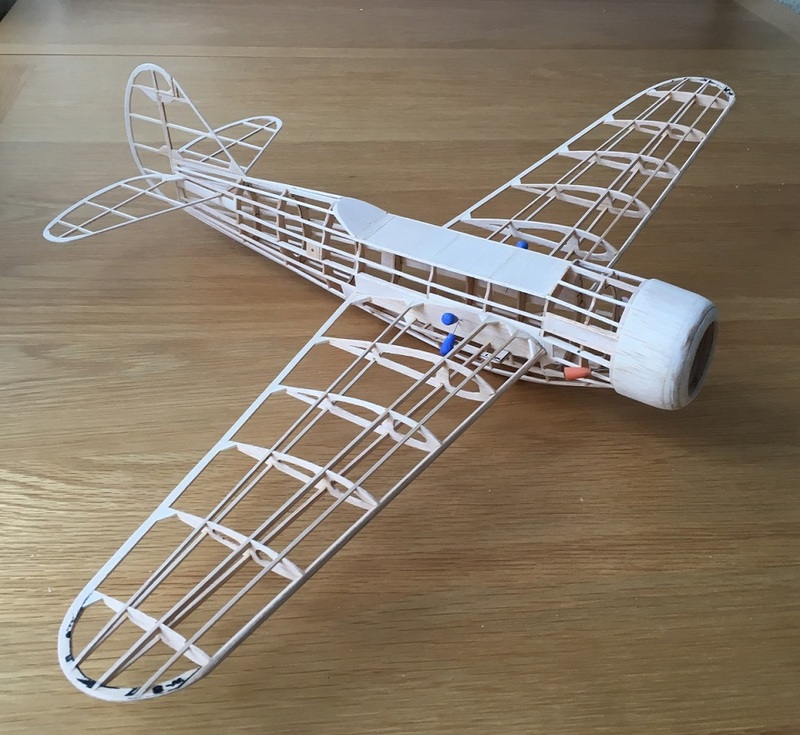 I’m also going to finish it in a rather boring scheme of overall silver, which will highlight every imperfection in my airframe sanding and covering. On the plus side, silver is the lightest colour to airbrush, as you don’t need much of it to get an opaque finish. I've not changed too much from the kit design and kept the fat sectioned wing, as it is part of the charactor of the aircraft. I have sneaked in a bit more dihedral though to get the wingtips up to the base of the canopy. The kit wood was pretty heavy - not as good as the stuff Dave supplies in his newer kits. 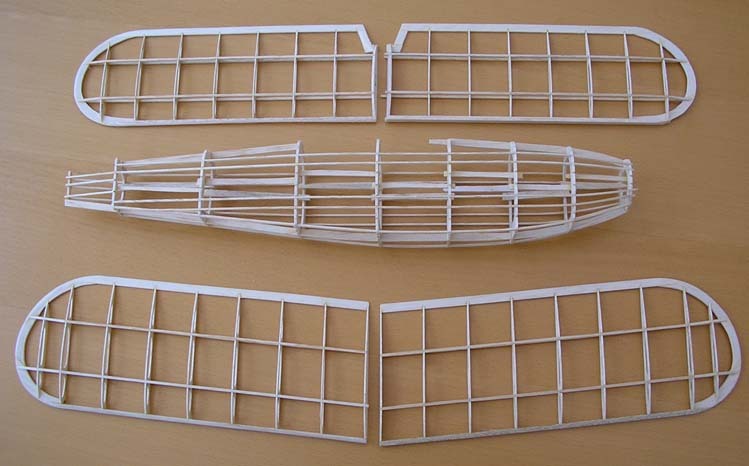 I used the kit strip wood for the wing spars but used lighter stuff for the fuselage stringers. I also sanded the wing ribs thinner (to about 1/24" inch) to save weight. The trailing edge gussets are purely for wrinkle prevention. You can see I added some soft 1/8" in-fill either side of the lower observation windows to properly capture the curvy shape. I also filled the cockpit opening with very light 1/32" sheet after cutting away the tops of the cockpit formers and removing the centre keel in this area. i think the sheeting weighs less than the wood I removed and gives me something to stick the crew to. The weight of the bones so far is 20.5 grams. The Consolidated Fleetster has been on my to-do list for many years, particularly because of the gorgeous red and gold TWA livery it wore. Plus it isn't often modelled. Dave Mitchell built one a couple of years ago for the Flying Aces Spanish civil war event and it proved such a good performer it flew away. He very kindly sent me a copy of the plan in CAD format so I could build one myself. 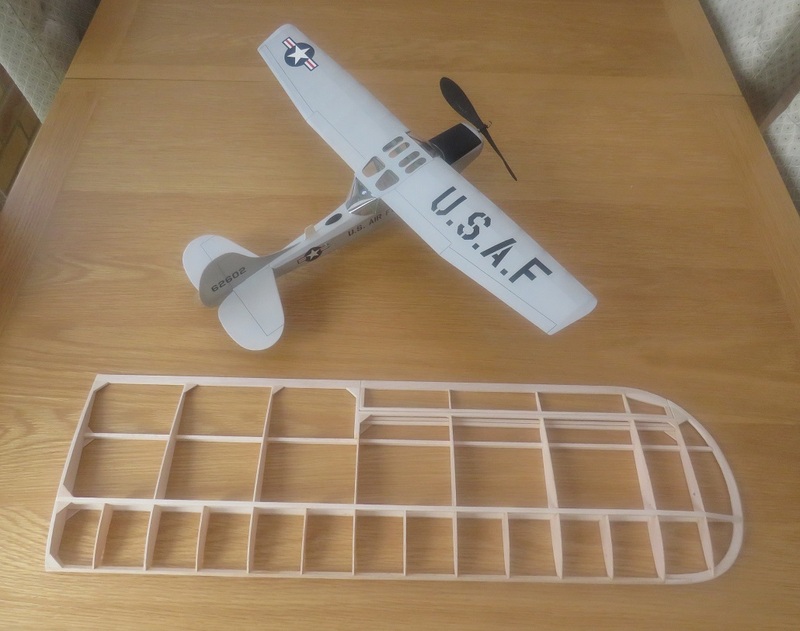 Inevitably I have fiddled with it a bit so it better suits the BMFA scale rules, for instance I have ruined Dave's thin high performance wing section to better reproduce the fatter scale section near the centre. This has the added benefit that the wing taper in the front view helps to disguise the slightly over-scale dihedral. Span is a touch under 24". This kit has been in my stash for several years but has only fairly recently come to the top of my to-build list because of discussions with a couple of other modellers about whether it would be possible to fly these monsters in the indoor kit scale class. The biggest potential stumbling block is the 200 gram maximum weight limit, but I think with very careful wood selection and with a rear rubber peg moved well fowards it should be possible. As you can see this is a very large model in a relatively small box. As a result there are quite a few spliced joints necessary if you used the kit wood. The plan shows a 3/8" x 3/16" main spar on the bottom of the wing which I changed to two 3/16" spars, one on the top and one of the bottom, which will better resist eliptical dihedral. The rear lower spar is 1/8" x 1/4" and this I left unchanged. All spars are from the lightest wood I could find with the 3/16" square spars being laminated from two pieces of 3/16" x 3/32". The trailing edge is also light wood and the ribs are from contest "C" grain balsa. The only hard pieces of balsa are the 3/16" square leading edges, where I used the kit wood (and had to splice them in the middle). I thought this might help if the model decided to taxi into a chair! 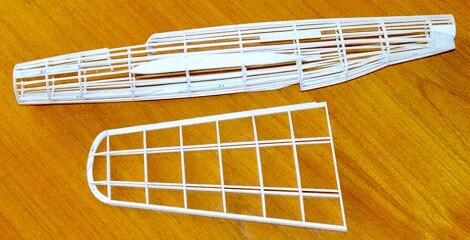 The separate ailerons are exactly as shown on the plan - I would rather not have had to make these as they add weight, but they may prove useful for trimming. Each wing panel has come out at just under 16 grams, so looking very promising. 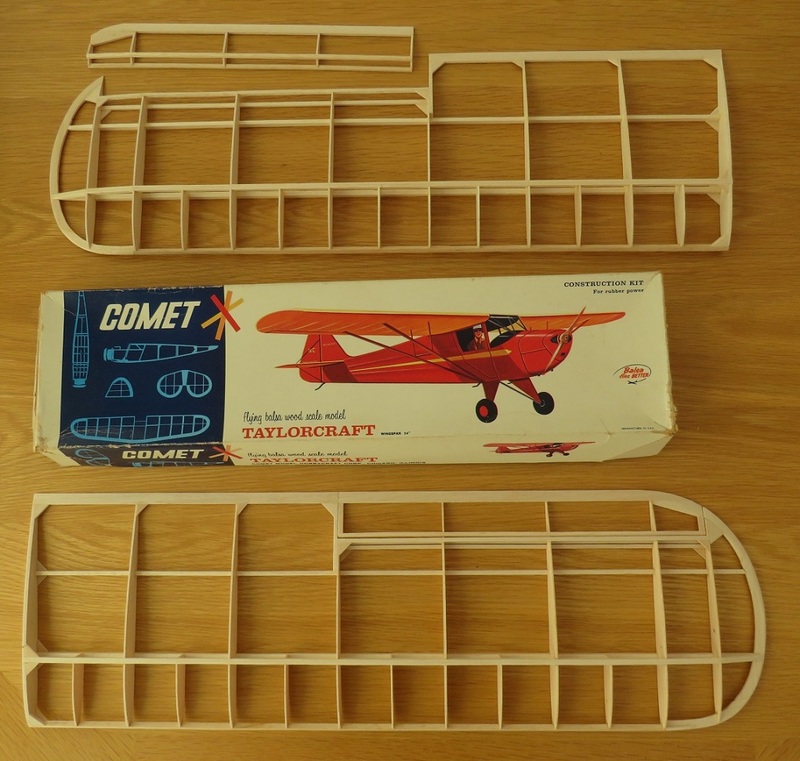 Just to emphasise how ridiculously big these 54" Comet models are, here is one wing in comparison to my Vintage Model Company Cessna Bird Dog.